As I sit here writing, a terrible thing is happening. It started mid-week, but there’s nothing being reported on the national news. No TV cameras or on-the-street interviews. I saw blurbs on Drudge and Breitbart this morning (Sunday), but no big fuss. As of this moment 54 of Nebraska’s 93 counties have been declared disaster areas. Seventeen rivers have set flood records and some six million people are affected. 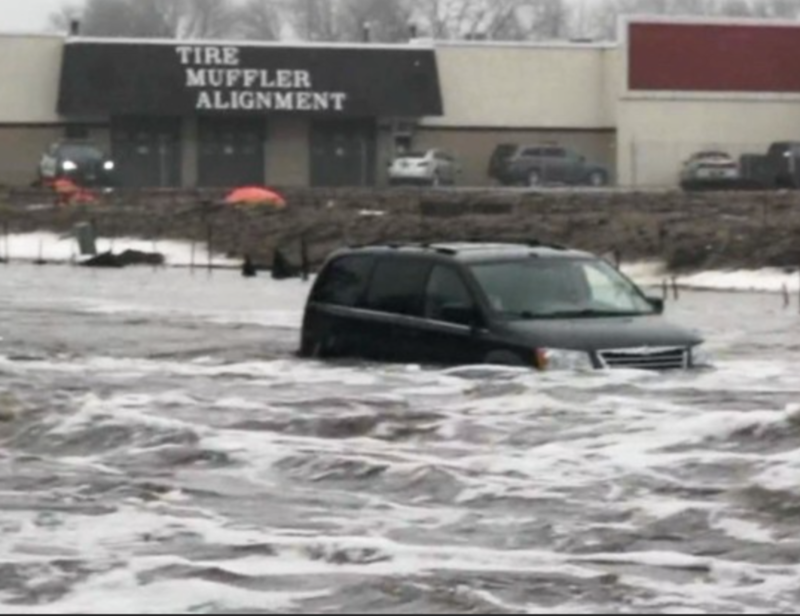 Offutt Air Force Base – just outside of Omaha looks more like an inland sea – thirty buildings are closed due to the flooding. South Dakota and Iowa have been affected as well.This was a hard winter and much snow accumulated and ice formed on all the rivers. Then suddenly the weather turned and most of that H2O turned liquid. What didn’t melt floated high-speed in chunks the size of cars, ripping out grain elevators and barns, tearing into houses and businesses. I saw one picture of a kitchen filled to the tops of the counters with dirt-laden ice. At the same time heavy rain began to fall. So far hundreds people have had to be evacuated from 29 small farming communities that are now more islands than they are towns. No one knows how many animals have been frozen or drowned. This isn’t warm water – it’s just one step down from ice and there’s a wild wind blowing. One picture I saw showed a cluster of maybe 30 cattle huddled together hopelessly on a tiny hillock in the middle of what looked like a vast, edgeless lake, but was really the Platte River far over its banks. One helicopter pilot said there were many more such tiny bovine islands across the landscape. Freemont, Nebraska, is completely cut off – no roads are left. The highways aren’t just covered in feet of water, they’re torn completely out or so littered with ice boulders as to be impassable. Dikes have been breached and many bridges torn out by the rampaging ice. And this is Nebraska – winter isn’t over. Meanwhile, back at the ranch, the bomb cyclone blizzard that hit Denver also hit the western half of Nebraska, dumping feet of snow. On Thursday I-80 from Grand Island, Nebraska to Wyoming was closed. Seventy mile per hour winds were blowing semis over onto their sides. The western half of Nebraska is cattle country, wheat country. It is sparsely populated by ranchers whose spreads may cover thousands of acres and may well own thousands of head of cattle out on those lonely sand hills. How do you go about protecting your herds in that kind of a storm? You don’t; they just freeze. This disaster hits me personally because Nebraska is my home state, and even though I haven’t lived there for over 40 years, the prairie is still in my blood, and seeing my grandparent’s little Garrison-Keillor town covered in 4 feet of water breaks my heart. Hearing that my home city of Lincoln is worried about its water supply – a town of 250,000 souls – scares me. I have people there. But what has bothered me the most is the realization that the news tells us so little of what is happening in the world. The TV news rattles on and on 24-7 and not a single story about the heart of this country and the suffering and struggle of our fellow Americans. Not until the story was three days old does it even make honorable mention. Two people are dead so far – one because he was trying to rescue another victim. There must be, if I know my fellow Nebraskans, many stories of heroism and heartbreak, but if my cousin and her kids hadn’t been filling Facebook with pictures, I wouldn’t know yet that anything was happening. This last week, on the other side of the world, 32 Nigerian Christians were brutally murdered by jihadists. Some missionary sources say the number is closer to 200. Has that been on the news? No. We heard all about the mosque attack in Christchurch, but not a word about Nigeria. In the last few years 6,000 Nigerian Christians have been murdered – burned in their own churches, beheaded, mutilated. But no major news stories. Silence.